Description: "Good," said Leaury, who had been awake all along. "I don't fancy staying here for another night. If we get out of here today we will be almost there..."
Description: The Juma smiled and uncurled her body. "Yes, I am," she answered. "I woke my pet up, but I managed to escape in a couple of minutes..."
Description: Kiya paused, and then realisation dawned on her face. "Yes," she whispered. "You need to get down to the treasury..."
Description: His eyes glowed a luminous green. "Blink!" Gioama shouted, losing his patience. "Move, anything. Just stop staring!" Description: The Kau continued to stare at her and she began to feel unnerved. "Well, aren't you going to ask my name?" the Kau said sadly. "Because that's what polite people usually do..."
Description: "But it's Ha-allowe-eeen," Atyr moaned. "Everyone else gets to trick-or-treat at Halloween time..."
Description: "Wasn't it obvious that he was going to choose Royal?" she asked. "It's bad enough that he acts like he rules the world. And now he has the colour to match..."
Description: "I can't believe Sylkon sent us here," she growled. "If it was a Genie that sent us here... then he made the wish! This is all his fault!" Description: When she finally came to join them again, she heard a name she was hoping never to hear again. "Malei?" she said. "What about him?" Description: "We should move," he said. "It won't do any good for Zariam to find us..."
Description: "You've been painted Halloween for ages, Fanger," Kieavin said as she appeared through the doorway. "You should be used to..."
Description: Macejaw laughed and cast Shadowheart a scornful glance. "You are ignorant indeed. A Werelupe, not even knowing his King?" Description: "Apsy snuck out a few minutes ago. I figured she was meeting with Fanger. Have you seen him?" Description: "Knowing her, she probably went running off to the Haunted Woods..."
Description: Fanger glanced at her, then his eyes flicked away to stare at a tree that loomed out at them. "I just never thought I'd come back here again. Voluntarily..."
Description: "I don't think they're in the Werelupe Woods anymore..."
Description: "I'm a new phenomenon. I am a Werelupe Hunter." Description: "Like I said, we don't answer to Werelupe scum," he snapped. Description: "I'm the Hunter," the brown Lupe replied. "I'm going to make sure there are no Werelupes left." Description: Jorange's eyes followed Apsy and Fanger as they paced back and forth, talking. The three of them were just out of sight of the DoN Headquarters windows. Description: "You're Halloween Lupes, not true Werelupes. The King has given orders not to let anyone in." Description: Viyexen moved up to Apsy's side as the Werelupes howled around her. She shivered at their savagery. Description: "You are no longer a Werelupe. Why would you bow to me?" the King asked with scorn. Description: That was the problem with being a pup; everything was too large for her, which made it difficult to steal an extra cookie. Description: Kintyre stopped laughing and turned to Quaz and Lithiarre. "Time to go," she said, bounding away from the hut as fast as she could. Description: "How do we get out?" she asked, staring out at the branching tunnels on either side. Description: "We're just a group of lost petpets, trying to find our way out of the Tomb. Do you think you could help us?" Description: Silence reigned, broken only by the Snowager's harsh breathing as he slept. Description: A massive head reared above her, jaws parted slightly. The jaws themselves were a jagged as the ice fragments around her. She crouched low, knowing it was hopeless. Description: "We'll never find their tracks if this snow keeps covering them up," Emari complained, and Tvarla had to agree with her. Description: "I know you can understand me," she said. "I am speaking your language, after all. 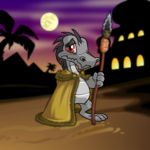 Petpet, I think you'd call it." Description: "Not quiet enough, obviously," Askar said, then froze as the Bori sentry looked up, eyes searching the ice in their direction. Description: The negg was nowhere in sight, but Tvarla could just make out a side tunnel between two stalagmites that jutted out of the ground, looking for all the world like two pillars guarding a doorway. Description: "I think the Snowager has left the Ice Caves," said Askar as he trotted up. Description: "Stop," she shouted as loud as she could, but amongst the commotion she was unheard. Description: The class was in chaos. Description: Without a moon there were plenty of shadows to hide in, but it was much easier in a large one. "Did you really think I wouldn't find you?" said a lazy voice right next to his ear. Description: "It seems like half a dozen Faeries disappeared last night. Into thin air. Don't pay any attention, though. They probably decided they had some strange quest they had to complete. Happens all the time." Description: The Lutari gave Cobolt a stern look. "I'll deal with this. You go," she said, waving her wand again. Description: "If we could just hit it with one powerful faerie spell, we could obliterate it, but we just can't get close enough..."
Description: Eva bounded towards the other Noils, who were clustered around Tamir. There were six Noils in all in the Circus, and all of them had been specially picked out and trained. Description: "Why did you invite a stranger here?" Karnu asked indignantly. Description: It had been the unanimous decision of what seemed like the entire circus that because she had brought the stowaway, she was completely responsible for training him. Description: "She's still not awake," Labez was saying. "I went up as close as I could to her face without burning it, and she didn't even twitch." Eva was frowning. "That's strange," she said. Description: With a grunt the giant Turtum woke from his sleep and stared blearily at them. Description: "These are fire pearls. How else do you think we get those fancy effects during the show?" Description: "You expect me to help you after you attacked my person?" the Miamouse snapped. Description: "I thought it was Max at first. But then he smiled and I just knew it could not possibly be him. So I tried to fly away, but he raised that awful black staff – it was just the same as my Max's – and then I just froze in the air. I was helpless!" Description: Eva's claws dug tightly into Max's shoulder, and she felt a bit faint as the land went past below them with alarming speed. Description: "Give it up, brother," a booming voice called. Eva looked up and realised that she simply could not tell which twin was which. Description: Things began to get exciting when they anchored off Mystery Island. Description: "Whoa," he continued, as Arkol opened his eye the whole way. "And your eyes have gone completely red. That is so weird..."
Description: He opened his eyes to Braedon leaning over him, his face uncomfortably close. "We need to move," the Krawk said. "Before any pets come." Description: Enchanting... that was the only word for it. The young Cybunny twirled through the water, watching the vibrant seaweed rippling around her passage. Description: "Get your scrolls here!" a Pteri at the stand opposite him bellowed, quickly appraising the Krawk and giving him a cheerful wink. "The cheapest scrolls in Sakhmet, and all ancient, too!" Description: Tazaa's home turned out to be one of five rooms in the narrow building. They climbed a flight of chipped steps to a landing that contained a wooden door that looked like it had been forcibly removed from its hinges several times. Description: "A few days ago a Shoyru came flying into Qasala asking about you. He had this scroll." Description: "How can you even see them in this darkness?" Souvier muttered, squinting at the spires of stone around them. "I didn't, it's the one thousand year old spirit that follows me everywhere," she said, flashing her teeth at him. Learn how to better understand Hasee Bounce with this simple guide. Maybe your Blumaroo is covered in itchy red lumps, or maybe your precious Draik is scared to leave the house. Whatever the case, there is a way to cure their disease. "How can you even see them in this darkness?" Souvier muttered, squinting at the spires of stone around them. Common puns find their way into Neopia. It's classic! It's monochromatic! "Things will be alright someday," she murmured. And then I looked at her and noticed that she was devastated. Her eyes showed it, even in the torch-light.